With the right "counterstereotypes," women are more likely to assume positions of power in industries dominated by men, Kim Delarocca of Pershing says. Why aren’t there more female advisors? It’s a confounding issue for many reasons, not least of which is that there are plenty of female clients and that women seem to possess many of the skills that successful advisors share. One reason may be the lack of “counterstereotypes,” a concept arising from psychological research suggesting that when a person is exposed to individuals who defy stereotypes he, or she, is more likely to overcome their implicit biases to those individuals. At a Thursday morning media roundtable in New York, Kim Dellarocca of Pershing delivered the results of a new survey that focused on investors’ perceptions of women and leadership, and how more women can be encouraged to enter industries and professions that are dominated by men, such as financial services in general and the advisor profession in particular. Dellarocca, global head of segment marketing and practice management for Pershing, revealed that the prominence of women in several popular television shows, such as “CSI” in its various iterations, produced those counterstereotypes in forensic science. While men are overrepresented (as a percentage of the overall population) in scientific studies, in forensic science programs 78% of the students were women as of 2008. At a time when “human capital” is one of the most important factors in advisory firms’ success and in the future of the profession, Dellarocca said that this “CSI effect” could be turned into a “Wall Street effect” that could help attract more women into advisory firms. However, the Pershing study of 2,000 American adults fielded in January by Harris yielded some paradoxes about Americans’ “complex—and contradictory” notions revolving around leadership and gender roles. The participants by a wide margin said they preferred leaders who evince “more collaborative” leadership styles that included qualities such as listening, consulting and asking questions, compared to the more traditional leadership approaches of “talk, give orders and answer questions.” Again, by a wide margin the participants (even men) said they associated the more collaborative leadership style with women, and said they were comfortable working with women leaders in many professions, including 66% who felt that way about personal financial advisors. When asked to choose whether they would “be most comfortable interacting or working directly with a man or a woman” in a number of professions or positions of power that are traditionally filled by men, the respondents tended to favor men over women. For example, when it came to president of the United States, 59% of the respondents said they’d pick a man as president if they had to choose. 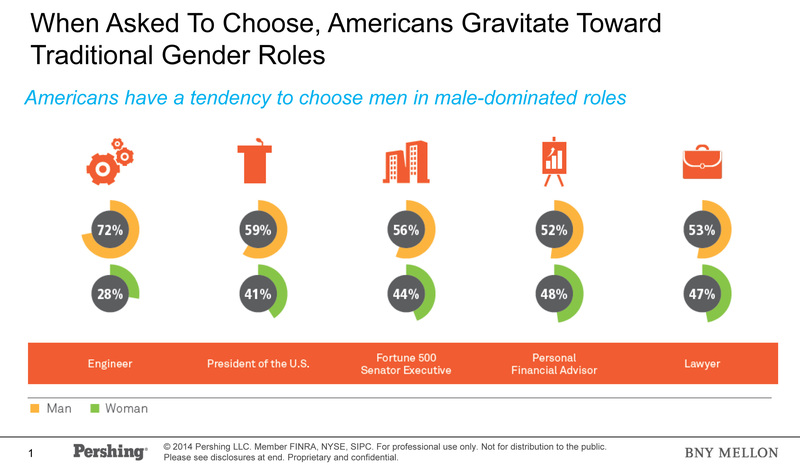 For personal financial advisors, 52% of respondents said they’d choose a man, and 48% said they’d choose a woman. Breaking down the preference by gender, the numbers shifted. Thirty-nine percent of men said they’d prefer a female financial advisor while 60% of women would prefer a woman. Additionally, the older the woman, the more she preferred working with a female financial advisor. The study found that while 58% of women aged 18-34 preferred to work with a female advisor, the number spiked to 79% among women 65 and older. “That’s the paradox,” said Dellarocca. “Americans say they’re comfortable with women in traditional male roles, but when push comes to shove,” they prefer the traditional gender to fill that role. Dellarocca cited other research that showed that only 20% of advisory firm clients actually work with a female advisor. There’s the rub, said Dellarocca: there aren’t enough female advisors to meet the expressed preferences of female clients at a time when separate Pershing research suggests there will be a shortfall of 237,000 advisors overall in the next decade. So beyond producing more TV shows that cast female financial advisors in a favorable light, what can be done to attract more women to financial services? Two other panelists at the forum — Regina Meredith-Carpeni, COO of BNY Mellon Capital Markets and Vanessa Weaver, a clinical psychologist and founder and CEO of the consulting firm Alignment Strategies — addressed the issues from their unique perspectives. In her capital markets leadership role, Meredith-Carpeni said she is in a part of the industry that is highly male dominated, where “tough skin and great quantitative skills” are crucial to success. In Pershing’s internship program, Meredith-Carpeni says, she’s targeting women studying the sciences and math. She’s also a fan of recruiting female athletes, particularly those from team sports (noting that both tennis and golf are team sports in practice) who have shown an ability to function well in high-stress environments. Once they are hired, she said, it’s important to give promising women “stretch assignments” that challenge their abilities to not only get a job done, but also to do so while juggling work and family responsibilities, which in general remains more of an issue for women in leadership roles than for men. However, Weaver said that in her experience, both younger women and men no longer accept the notion that you have to sacrifice either family or career to be successful, which is already changing corporate cultures. Meredith-Carpeni cited the Pershing study and other research that found women tend to be less comfortable than men in taking leadership roles at work: they are less likely to sit at the head of a table when meeting with co-workers, for example, and are less likely than their male counterparts to ask for a raise or a promotion. She recommended that nascent female leaders join affinity groups, such as Pershing’s own Women’s Initiative Network (WIN), which in addition to networking and mentoring opportunities provides participants with “a chance to practice” their leadership skills, while also looking to impact the firm’s bottom line through exercising their leadership, which she admitted is a tougher challenge. When asked if the lack of comfort with exercising leadership reflected the more risk-averse nature of women, Dellarocca said she thought women were “more risk-aware; not necessarily more risk-averse.” Meredith-Carpeni said she was also heartened by the behavior of women ages 25 to 30, who she said were “very aggressive” in exercising their leadership roles. Weaver, who works with the WIN group, spoke about the power of culture in a corporation, especially on Wall Street. “Individually, women want to be perfect” in their work performance before taking leadership risks, but some corporate cultures are “so rigid” that newly hired young women are “told in many subtle ways” that they can’t be leaders. So by the sixth or ninth month of employment, those young women begin to take fewer risks and thus diminish their leadership potential. She related the employment experience with the well-documented trend (see the seminal books “The Cinderella Complex” and “Reviving Ophelia”) of girls who have shown great facility at math and science, but who by the sixth or seventh grade start to question themselves and drop their interest in those subjects. Dellarocca placed the issue within the broader concept of the value of diversity in the workplace. “It’s where your clients are,” she said, but it’s also “where your employees are,” recognizing that diversity and flexibility at work will benefit both men and women.